There's a lesson in this I just know there is! 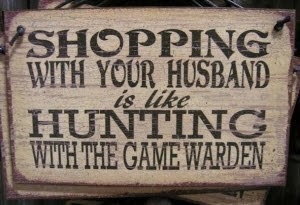 Have you ever been shopping with your husband? like you are indeed hunting with the game warden? (before our kids came along) we would actually enjoy shopping together. even though it wasn't so much for saving those dimes at the time. he came home with a 5 pound can of peas! Ick! Canned peas are mushy and just plain icky! "what am I suppose to do with this?" He tells me "It was a really good deal!" It was always a great conversational subject with all our friends! And Now that we have kids... well, that's for another time! look for the best dime saving deal and hurry to get out. that you thought you might wanted to look at. becomes way outta your price range. experience anymore either, quite frankly. I think I have turned into the game warden now!! HA! but I'm not really sure where I was going with it. we all just needed a good laugh today! Yep, that's what it was! Great... I've done my good deed for the day! Take time to be a little silly! Good Morning, This was so cute, And the can of peas is really funny. Now, maybe you could of made pea soup LOL! I do not care to go shopping much anymore myself. But the quote was very funny, and I did get a good laugh from it. So you have done your good deed for the day! Hi Amy! PS I LOVE pea soup!! I really loved following your stories of shopping with your husband and family. It's something we all do, and some love it and some despise it. And to some, it's a necessary evil! I do not like shopping for groceries with my husband. I am a list shopper. If I need apples, I get apples. My husband stands in front of the apples and compared prices, apples, dents and bruises...while I do a slow burn in the corner by the celery. We have a deal now. He shops for groceries, and calls me if he has a question. Much better. wishing you a very cozy and sweet to you dear friend!! Yes, I look at shopping as a chore but sometimes this chore does bring rewards that can't be beat. Shopping with my hubby is always different then shopping all by myself. He is a sucker for anything on sale which is cute. I think I have been blessed beyond belief when I can go shopping without the kids lol! That is a vacation ha ha ha! Ohhh Happy Birthday beautiful Amy!!! I hope your day was lovely. You are such a treasure! I laughed so hard when I saw the title of your post. On a general basis, I do not like to shop with Benjamin. But, on many occasions when he is not in a hurry, he will be very generous and treat us while we shop for groceries. Because of those special times, I tend to WANT him to come hehehehe. I don't know why I am just now seeing this post… It somehow slipped on by; anyhow, so cute. I remember this plaque, and have always gotten a great chuckle out of it. It really does feel that way. I got a good laugh at Barry and the can of peas..so cute and funny. I have never really cared for canned peas, as you say too mushy; ha but a good deal, well what good man could pass it up? I am like you, I don't really enjoy shopping any more. I used to, oh well, there are worse things in life. Love ya Amy, look forward to seeing you soon. This is a funny sign and I have not seen this one before. I hate going to the store with my husband. He stops every few feet and says, "hey, look at this!" It takes forever to just pick up a few things!!!!! I signed on to follow your blog. Look forward to visiting.